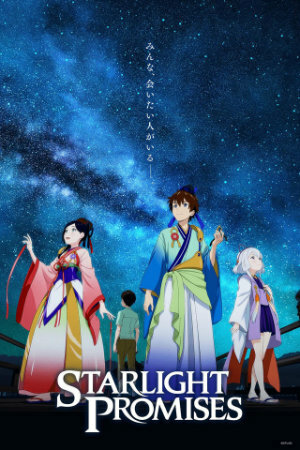 Distributor: Licensed by crunchyroll for video stream. Shoma Mihara gets a text, and call, from his old friend Fujii Atsushi, who he hasn't heard from in over three years. When he goes where he's directed to for the meetup, somehow he winds up in a village where people are preparing a medieval-style Tanabata Festival (though with oddly high-tech direction.) He meets a girl named Shiori Senozawa, who's also there to meet someone. He also encounters the director of the whole affair, an apparently younger girl named Ai Kana, who turns out to be a bit unusual. Shiori and Ai try to gently correct Shoma's mistaken view about what's going on here, a somewhat difficult task since he's a bit slow to take their hints. "Aren't you forgetting something important?" - Shiori, to Shoma. Yes, Shoma has forgotten something important, but it's only his slowness in catching on, along with a completely gratuitous group of villains, that enable this show to even run as long as 62 minutes. Ai's reluctance was harder to understand; given her nature, I didn't understand why she didn't just go ahead and lay it all out for him. Nevertheless, she's as oblique with Shoma about the nature and purpose of this particular Tanabata Festival as Shiori is. I was a little puzzled about another thing too: if I understand all this correctly- Ai's fullest explanation, when we get it, is delivered rather breathlessly, and in the midst of a crisis- the manifestations here are not REALLY supernatural at all; so why the Festival at all? Oh, I get the reunion symbolism- Tanabata honors an annual 'reunion' of the Princess Orihime (as the star Vega) with the cowherd Hikoboshi (as the star Altair)- so are things being done this way to give some mystical credibility to the proceedings in the minds of the participants? And under whose sponsorship in the first place? Inquiring minds want to know. And yet, for all her cryptic tendencies, I LIKED Ai quite a bit- maybe it's her diligence and responsible attitude. So we've got Ai's earnest efforts to make this all work; Shiori's compassion (tinged with a bit of melancholy- you'll find out why); and Shoma's indignant confusion, fed by an erroneous conviction he's substituted for the important thing he's "forgotten". I think I may be forgiven here for liking the two ladies more than the gentleman. Well, I did mention that there were some villains in the show, whose presence is (literally) accidental, arbitrary, and otherwise unconnected to the plot- they're obviously only there to give us some action sequences (well, and to give Shoma some reason to threaten to bail on everyone.) There's also one equally gratuitous fanservice scene (Shiori in the bath.) Some of the artwork is quite beautiful though, particularly in the festival itself, and especially in the dance scene. Oh, and if you're interested: Tanbata occurs around July, but anytime during the Northern Hemisphere summer months, locate the Summer Triangle (not difficult- they're three of the brightest stars in the sky at that season. It's not an equilateral triangle, though.) The stars are Deneb, Vega, and Altair. Deneb is part of Cygnus, the Northern Cross, which you can eliminate by the cross-shape of its pattern. The other two stars are the ones we want. Vega (Orihime), which is in Lyra, has a little rhombus of stars associated with it (the "body" of the lyre); the other star is Altair, in Aquila (Hikoboshi.) In what may have been unintended early feminism, Orihime is a bit brighter than Hikoboshi!